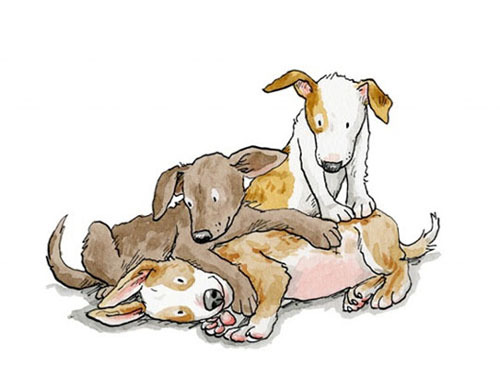 Anita Jeram is best known as an illustrator and author of children’s books, particularly the modern classic ‘Guess How Much I Love You’, written by Sam McBratney. Constantly drawing, Anita Jeram’s artwork extends beyond purely illustration. With a gift to capture character and emotion with a simple pen mark or a sparingly placed brush stroke, Anita Jeram creates images full of empathy for her subjects. Anita Jeram’s constant inspiration is the natural world and particularly the menagerie of animals that share her family’s life. ‘A Dog’s Life’ is a collection specially created for Aquarelle Publishing and each artwork captures the essence of the subject with humour and warmth. The standard framing is double-mounted in a high-quality one-inch square plain oak, protected with clear wax. A white frame with black highlights is available at the same cost.